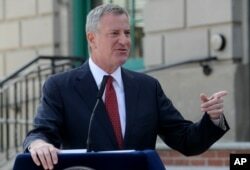 New York City Mayor Bill de Blasio wants to raise taxes on cigarettes to persuade people to stop smoking. He would raise the current $10.50 minimum price for a pack of cigarettes to $13 in New York City. De Blasio said the goal of making New York the most expensive city in America to buy cigarettes is to reduce tobacco use. If people have to pay more, he said, they might decide to stop smoking, or, even better, never start. The mayor is pushing a number of bills. In addition to raising taxes on cigarettes, his bills would limit the number of places selling tobacco products in New York. Under one proposal, the city would bar drug stores, also known as pharmacies, from selling cigarettes. 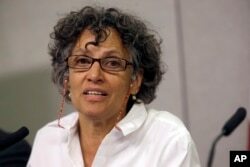 Dr. Mary Bassett is New York City’s commissioner of health. New York City Health Commissioner Mary Bassett. New York is America’s largest city, with over 8.5 million residents. The city’s Health Department says the percentage of New Yorkers who smoke has dropped from 21.5 percent in 2002 to 14.3 percent in 2005. But that still leaves 900,000 smokers in the city. An estimated 15,000 of the city’s smokers are under age 18. The idea behind the mayor's proposal is that people will stop smoking if the cost is too high. Opponents said many people will continue to smoke and that some will be pushed more into poverty or find places to get illegal cigarettes free of taxes. “Over time, it's proven again and again that these efforts are ultimately ineffective as people, minors included, turn more and more to the bootleggers,” said Audrey Silk. She is founder of NYC Citizens Lobbying Against Smoker Harassment. But de Blasio said government has a moral responsibility to discourage people from smoking. He said that higher prices have been shown to stop people from smoking. “When it comes to New Yorker’s health, big tobacco is pubic enemy #1,” de Blasio said. The World Health Organization says there is no doubt that smoking cigarettes is harmful. “Tobacco is the only legal drug that kills many of its users when used exactly as intended by manufacturers,” the WHO said in a report. It says smoking is responsible for about 6 million deaths a year across the world. Globally, the WHO says there are 1.1 billion tobacco smokers aged 15 or older. About 226 million smokers live in poverty, it said. Smoking rates and taxes differ across the world. The countries with the highest percentage of smokers are Serbia, Bulgaria, Greece, Russia and Slovenia, the Tobacco Atlas reports. But the countries with most cigarettes smoked are China, Russia, the United States, Indonesia and Japan, the Tobacco Atlas said. The Chinese smoke more cigarettes than all other low- and middle-income countries combined, the Tobacco Atlas says. The atlas is put out by officials from the American Cancer Association and World Lung Foundation. Numbeo.com is a website that tracks the cost of living around the world. The site reports that the most expensive countries to buy cigarettes are: Australia, $18.77 per pack; followed by New Zealand, $16.19; Bermuda, $12.24; Norway, $12.23; and Iceland, $11.81. In 2016, voters in two American states -- California and Colorado -- voted on separate proposals to raises taxes on cigarettes. Voters in California approved a $2 tax increase per pack of cigarettes. But voters in Colorado rejected a $1.75 tax increase. The New York City Council will now decide whether to approve or reject the anti-smoking measures offered by Mayor de Blasio. Bruce Alpert reported on this story for VOA Learning English. Hai Do was the editor. We want to hear from you. Write to us in the Comments Section and share your views on our Facebook Page.